currently obsessed with this rug. Protecting my skin will always be a priority. Yes, I am that paranoid mom who is constantly applying sunscreen on my son and myself every eighty minutes. When I was younger I never took care of my skin. I would go outdoors and I never applied anything to protect it. I was young and careless. My skin was always dry and extremely sensitive. Skin care is so important now. I want to avoid any dryness, premature aging, dark spots, dehydration and cancer. 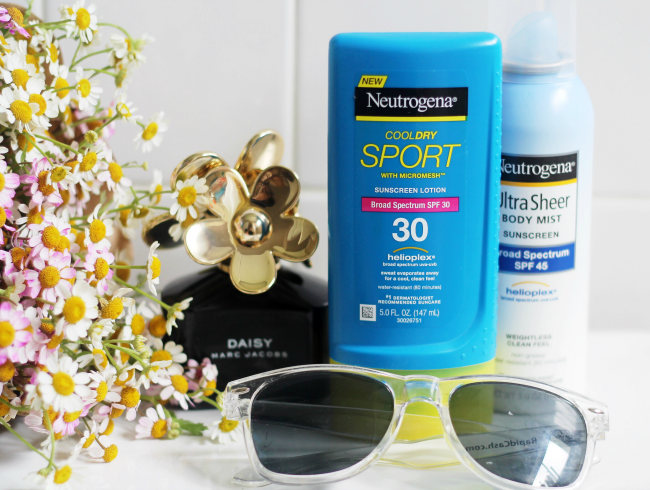 I turned to Neutrogena products to give me brighter and healthier skin. I learned that one in five Americans will develop skin cancer in their lives. Yet skin cancer is one of the most preventable cancers. And with early detection, most cancers are curable. If it can be preventable why not take the initiative and take care of our skin? It's that easy! I can proudly say that my skin is healthy by following a few simple tips. Stay well hydrated to give your skin the glow it needs. The heat in Texas is on another level and I always carry bottles of water. Always wear UV-blocking sunglasses, wide-brimmed hats and if necessary bring an umbrella. Especially if you are going to a pool party or the beach, because you'll be outdoors for longer periods of time. Wear comfortable clothing/layers. I love to wear kimonos or a sheer light layer to cover my skin from the sun. Apply sunscreen 20 minutes before you are exposed to the sun so your skin has enough time to absorb it. Remember to reapply every two hours. Remember, the sun's rays are strong even when the clouds are out. Always apply sunscreen SPF 30 or higher. Neutrogena has a variety of great products that will help you keep your skin healthy. 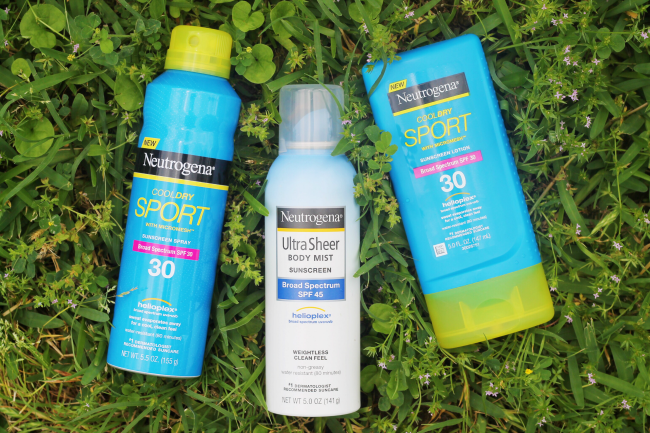 I really like Neutrogena CoolDry Sport collection. It is ideal for outdoor physical activities or sports. Being outdoors requires a powerful sunscreen to stay protected. Most sunscreens are so greasy and sticky but CoolDry Sport offers superior UVA/UVB breathable protection. It goes on smooth leaving skin cooled and refreshed. I use this for my outdoor workouts or a day at the park with Evan. Neutrogena Ultra Sheer collection is absolutely my favorite. I have the body mist sunscreen and I love that I can use it all over my body. I apply under my makeup because it is oil free and won't clog my pores. This is more of a daily use sunscreen which is easy to apply. It has no sticky residue and absorbs fast leaving a fresh scent. These two products are on my vanity and will be there all summer. I will definitely purchase the kid products next! I hope these few tips will help you take care of your skin all summer long. For more tips and info join the Neutrogena twitter party on May 19th at 7-8pm EST (4-5pm PST). Make sure to RSVP here.